One of the first ways I help families struggling with picky eating is to review their meal and snack schedule, or routine. Having a schedule for your little one (usually after about 14-16 months of age) can make a world of difference when feeding your child. Why? Having structure helps your child. There has been a lot of research on children benefiting from routine. Routines create predictability and help children to plan their day. Having a feeding schedule builds upon this structure. Children know what to expect when it comes to feeding and when to expect meals and snacks. It helps you. Children aren’t the only ones that benefit from routine. Having this in place is helpful for parents and caregivers as well. 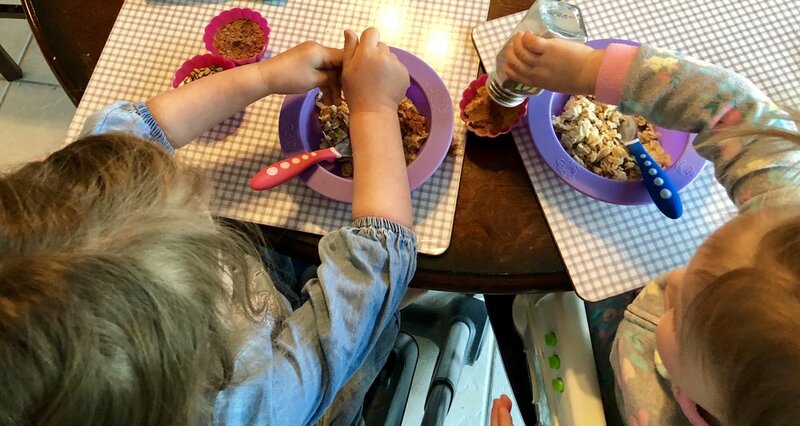 Feeding is hard enough: knowing when you are expected to provide food for your children can help have a solid plan in place. For example, when you are planning an outing, you will know how many snacks/ meals you need to think about while out. It maximizes your child’s intake. I work with a lot of clients that sometimes think if they allow their child to graze all day, their child will intake more food throughout the day. This is simply not true. Think about a gas tank: if we are constantly topping off the gas tank, we are never allowing it to fully empty, so we can completely fill it up again. The same goes for our stomach. If we are constantly eating small amounts, we are not allowing our stomach to empty and digest our food so we can feel hungry. When we have a break between meals we allow that food to digest to maximize our hunger at the next meal or snack, and allow the most food to be eaten. So, how do you go about implementing this? Think about timing. Most young children do best with meals and snacks every 2-2.5 hours, while older children do best with meals and snacks every 3-4 hours. But read your child. Some younger children can go longer stretches without food, while some older children need meals and snacks to be closer together. Consistency is key. Try to stick to your schedule as much as possible. Strive for five to six. Most children do best with 3 meals and 2-3 snacks per day (breakfast, morning snack, lunch, afternoon snack, dinner, optional bedtime snack). Balance. Think about meals having 3-4 foods and something from most food groups, while snacks are smaller. The types of foods don’t necessarily matter, it’s more about the quantity. Keep in mind though that some little ones may eat a larger snack than a meal, and that’s okay. This is why it is important to provide nutrient dense food for snack, not just at mealtime. Try an afternoon Snack. If specific meals are challenging, think about why. I have worked with many families in which dinnertime is truly challenging. I invite these families to think about an afternoon snack: does the child need something more substantial at an afternoon snack, so that they are satiated for dinner, or conversely, does the afternoon snack need to be earlier so that they feel more hunger at dinner time. “Kitchen is closed.” Try using this phrase with your children. Offering regularly-spaced meals and snacks should be combined with limiting random snacks or grazing. If your child is currently choosing their own snack, try offering two choices, this helps give them that autonomy to make a decision. Don’t expect an hour. Use this guideline for the duration of meals and snacks: meals should last 20-30 minutes and snacks about 10-15 mins. Still struggling? What has worked in your house? I’d love to hear from you.